I was inspired by my Gram to learn to crochet. 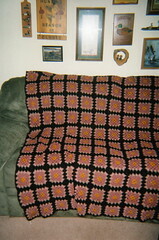 The single colors afghan was made by my Gram back in the late 30’s-early 40’s. And actually it was made from yarn that was originally knited into a two piece outfit by my mom when she was about 18-19. 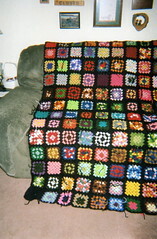 When my mom no longer wore the outfit, Gram reworked it into the granny afghan. It was always the one I remember being covered by as a small child. It’s very special to me, and I do have it. Gram had taught me to sew clothing for myself as I grew up, and just out of the blue one day I asked her to teach me granny squares. I was a stay at home mom when my kids were little and I wanted to do something more than sew. Gram was a good teacher and I was able to learn in no time. That’s when I made the multicolor granny for myself. Gram’s gone now but I have more fond memories of her than I could ever count. She was so important to me, teaching me to crochet, sew, cook, and alway to love me. I can still remeber sitting at her house and here hands helping me to make that first granny square. They are both amazing, keeping up family tradition is a beautiful thing. i love the bright colors! i really need to do one of these so that i can finally learn some new stitches.